I am seeing it from everyone: A cry for help from Star Wars fans as they try desperately to watch all the previous Star Wars movies before the new release comes out on December 18th. They are swapping old DVD's. They are searching eBay. Others are putting their neck out to try to access bootlegged copies in time to be "all caught up" before the big day. The decision to allow digital copies of the movies to only be purchased, but not rented, has thrown many (like my family) into a tizzy. We rent digital movies all the time, but buying them -- at $20 a pop -- is a bit out of our budget, especially when there are so many movies to see in such a short time! 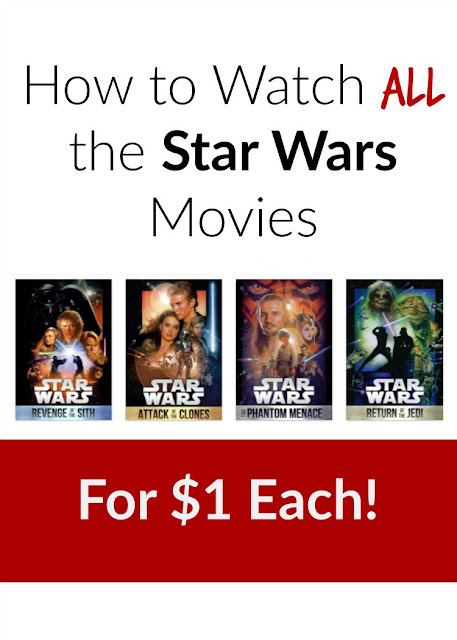 But there is one service out there that actually lets you stream movies that you could only previously purchase for just $1-2, and it's changing the way my family plans on binge watching the Star Wars flicks. VidAngel was designed to allow families to purchase their own digital copy of films, complete with select editing for offensive content. They are then able to "sell back" those same digital films for all but $1-2 of what they originally paid. Whether you ever use VidAngel to watch those rated R comedies you swore off minus the 45+ F-bombs, or you really want to enjoy that 90's rom-com with your daughter (without one awkward bedroom scene, of course), you can still find many ways to indulge in many titles that were previously off-limits for the rental crowd. I'm already purchasing my first Star Wars flick to watch tonight, and I know that I can leave it pretty much as is (although I may skip the final credits in my copy.) Selling it back tomorrow for all but $1 of the original price after sellback sure feels like a rental to my wallet, and I look forward to binge watching the entire franchise in time for the December 18th premiere!